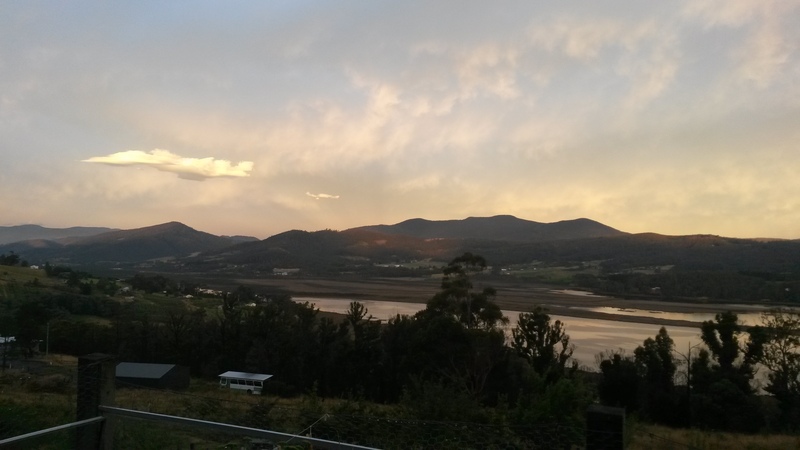 I’ve just arrived to Tasmania and my first impression is that it is an absolutely beautiful place. I’m right on the ocean at the moment and the “city”, Hobart, consists of a number of parks and pretty stone and brick buildings. Once I got dropped off by the bus I walked down to check out the harbor and then found myself a little cafe to have their soup of the day. 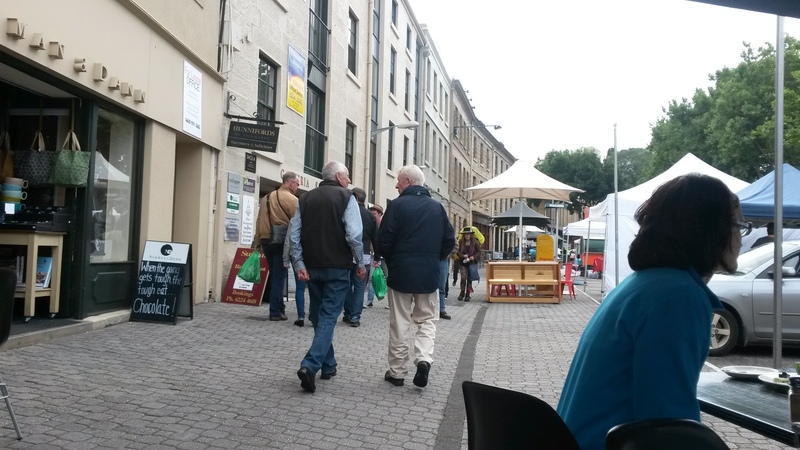 There is a market going on and I watched everyone stroll around looking at all the home made goodies. If there is one thing that I truly love about Australia, it’s her markets. After eating I took a quick walk down through the market. I couldn’t stop and look at anything really because I always want to buy things. By the end I was at the entrance of a beautiful park in front of the Parliament House, so I set everything down and laid in the grass to read until Celia could come pick me up. Her sister, Julian, wound up picking me up and bringing me to her house where they were having a bit of a family day. The whole family was very warm and welcoming and we sat for hours snacking on finger foods and telling stories. I felt right at home instantly. Jules showed me her garden and I have to say it is just beautiful. 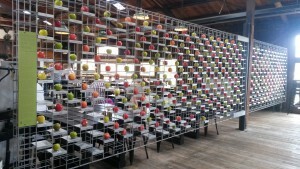 So many vegetables and fruit trees were crammed into such a tiny space but in a very organised and artistic way. Celia and I stayed long after the rest of the family left and it was well past dark when we made our way to her place 40 minutes away (and that’s saying something because it doesn’t get truly dark until about 10 in the summer here). 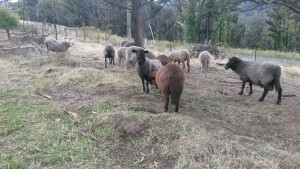 Celia dropped me off at the bottom of the driveway where my little white bus stood, just across from her paddock of sheep, and helped me put a sheet on one of the bunk beds and settle in. I’m loving this already. My first day of WWOOFing was a success. I woke up and head up to the house to meet Celia’s son Ferguson, daughter Meg and two dogs Poppy and Pooh Bear, who I later learned to love and wanted to take home so bad. Sundays at this particular farm is the “day off”, but Celia and Jules planned to go apricot picking and they graciously brought myself as well as the French couple that is staying with Celia (Anise and Richard) along. I haven’t been fruit picking in a long time and it was a wonderful way to spend the day. 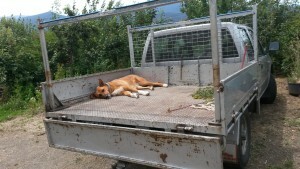 Julian’s dog, Woody bounded around making friends with all the children and eating tons of fallen apricots. We had packed a basket of snacking foods and stopped for water and snacks whenever we felt the need. Celia said she wanted to get about $60 worth of apricots. Half way through I told her she had it but she didn’t believe me. By the time we were done, she had $180 of apricots. She knew what we would be doing the next day…. In order to create a garden bed, you can put a chook fence around the area that you would like to put the bed in. Put 5 or 6 chooks in there and just take care of them as you normally would, feeding them their garden scraps, greens and grain/seed mixture. The chooks will eat, scratch and poo all over the area and within two weeks you will have a healthy piece of land for your garden bed. Even better if you till it first. When putting egg shells into your chook’s feed mixture, bake them first. 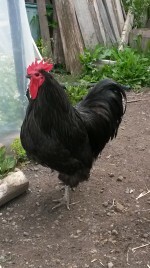 This will prevent them from from associating them with their own eggs and getting into the habit of eating fresh eggs. A good way for preserving peas and beans is to first steam them for one minute, and one minute only! After one minute, strain them and immediately pour ice cold water over them. Place them in a freezer bag and stick them in the freezer. Ducks are great for your orchards, and even good to occasionally set loose in your garden. They don’t scratch away at everything but they poo and eat slugs as well as some other pesky pests. Compost is a very powerful thing – more to be learned in the near future. Make sure you have appropriate rain cover for your worm farm. Jules’s worms are all drowned after a good rain. My first day of “real work” went well, and I bet you can guess what we did. Well, first I finished painting Celia’s small bathroom, but that didn’t take long. Then it was apricot time. 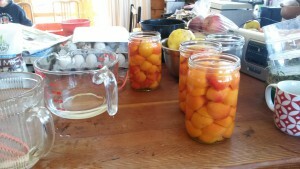 Anise and I sat at the table for hours pitting apricots and putting the perfect ones into big jars and the very ripe ones into a large pot. Once the jars were filled, we topped them up with water and sealed them with the covers. A small while later these jars were put into two large preserving pots that were filled with water about 3/4 of the way up the jars. We turned them on low and once the temperature of the water hit 83 degrees C, we turned on the timer and let them boil for 30 minutes. This sealed the jars and we brought the jars down to the pantry for storing. 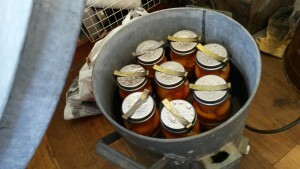 The more ripe apricots were put on the stove to stew. We added half the fruit’s weight worth of sugar in and cooked them to “setting point”, when it’s no longer watery. This stew was then put into jars as jam. 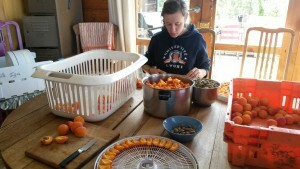 Other apricots were pitted, halved and put onto the many trays of the dehydrator. Some others were stewed without adding sugar and placed in the dehydrater in a flat paste. These bits came out as dried fruit and fruit leathers. Celia wound up having to put these away because we couldn’t all stop eating them. I took a break in the middle of all of this to feed and water all of the chooks, ducks and roosters. Soaking your chicken meal and wheat for 24 hours and letting it sprout makes it easier for them to digest. They will get more nutrients from it this way. When buying chooks, be sure to look into traditional chook breeds so as not to support commercial breeders. Apparently the amount of meat I eat is terrible for me, haha. I’ll have to look into that. Here at the farm it’s mainly a vegetarian diet. No meat yet! 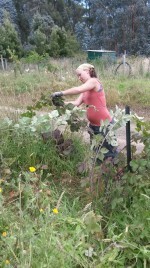 Today we started in the garden weeding, planting and mulching. The view here is absolutely breathtaking and it made working in the garden very peaceful. Once we were done in the garden we started putting up a fence. There was a fire at Celia’s place at the beginning of the year and it brought down most of her fences. 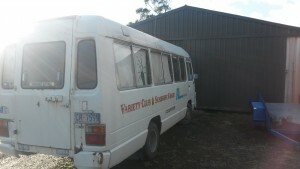 So she is re-designing and re-building her land into manageable pieces and paddocks. 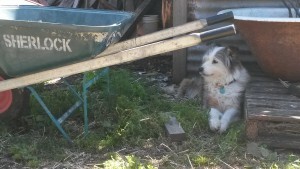 I broke away after a little while when the work got very physically demanding in order to water the seed house and the chooks. Before long, the work was done for the day and we went to pick up another WWOOFer, Maddy, who is coincidentally from Vermont. She’s a pretty cool chick from what I can tell. We hung out at the park by the river, played a little tennis and walked the dogs. I look forward to more experiences in the morning! It’s important in permaculture to map our your land and designate the different pieces into zones. Zone 5 is natural forest. Not too much to say about today other than the fact that it was HOT! We spent the entire morning on the fence. 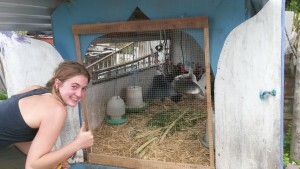 Maddy and I also broke off to take on a little project of creating a vented door for the young chook pen because they were overheating. We nailed some boards together, nailed on a wire front, added some toggles to the pen to keep it on and vwalah! But after lunch it was just too hot to go back out. I even burned a little bit and that’s just craziness because I just don’t burn. After lunch we all just relaxed and then went to the river for a dip. The river is freezing so it was a jump in and frantically climb out situation but it felt incredible. Fantastic little snapshot into our future; hard work and hard relaxation. After the dip, Maddy and I went into an organic cidery and tasted a few ciders. I bought one for Aaron that I think he will really enjoy. No sugar or preservatives added so it’s just dry and not too sweet. Very tasty. Today was pretty cool because Maddy and I were left to do work on our own while Celia brought Anise and Richard to the bus stop and then went out for a family day with her kids. I fed and watered the birds in the morning and then Maddy and I made some fence stakes with thick wire and secured the fence in the chicken paddock to the ground. After that, we cleaned up the work site next to the fence we finished with Celia and mended some netting over the small house garden. The rest of the work day consisted of Maddy digging/pounding a path up to the chicken paddock and me pruning and tying up the branches of the blackberry bushes along the driveway. I also spent a ridiculously long time watering the garden. After collecting the eggs at the end of the day, the second half of the day was spent baking, cooking and jamming out to music. Another wonderful snapshot into our future. The greatest lesson learned for me today was to be sure that we choose a state with plenty of rainfall as well as design our property appropriately with dams, water tanks and swales so that minimal effort is put into watering the property. Celia has nearly run out of water and we aren’t able to take showers at the moment. 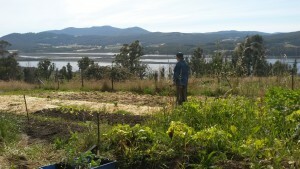 She also has no irrigation system set up in her gigantic market garden and so watering it was far too much of a process. It took me over an hour to water it with the hose, having to drag the hose around and change up where I was connected multiple times. What a pain. Not something I want to have to worry about on a daily basis when it hasn’t rained much. I will be studying the art of designing an appropriate water system into our property very seriously after today. 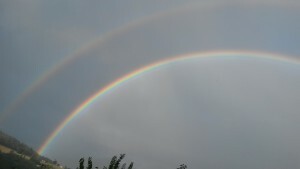 It has been a lovely and relaxing weekend in the valley of rainbows. Friday was spent weeding and mulching the tomato garden. An easy day of work that went by quickly. On Saturday after the morning chores we took Celia’s kayaks down to the river. It was a process getting us all in but we managed it and soon after paddling off we came to a nice sail boat with a man lounging about listening to music. We stopped by the boat, tied off and climbed up to have a chat with him. His name was Ian and he was fascinating. He built the boat all himself and had sailed it around the world. He preferred the uncharted corners of the earth. Our chat lasted nearly an hour before we figured we should get back to paddling. That afternoon was the best afternoon so far. The river is so beautiful with gorgeous birds and boats everywhere. The most wonderful part was going through the canal. It was like kayaking through a jungle. After a few hours we made our way back and spent the rest of the day stopping in to see friends of Celia’s. That night we went to the best Cider Bar I have ever been to in my life. 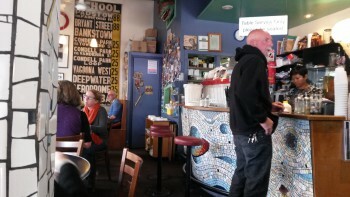 The back half was a cider museum with all of the history of apple cider in Tasmania. Such a good time. Maddy and I spent today going to a market that was being held in the old theatre and walking around the town checking out antique shops and museums. I got a nice dress for $10 at the market along with a cooking class book/dvd set for $8. Still working on my cooking skills. We finished the afternoon with an amazing homemade brownie and chai tea. It’s Australia Day tomorrow! We’ll be working though. For now I’m off to bed. I’m finally on my way home back to my wonderful husband and crazy little dog. Monday and Tuesday were very relaxed days of baking Whatever Cookies and sowing seeds. What an awfully tedious job when done by hand. I did one last weed job just outside of the fence of the garden as well. As I tore up the weeds and grass I had a line of chickens scratching and pecking where I had torn everything up. Good team work guys, haha. These birds are hilarious. But the days went by quickly and the rest of the time was spent reading books by a gentleman named Joel Salatin who has been raising chooks since he was ten. I got a lot of insight from his books. I will not be eating chicken from the supermarkets from here on out that’s for sure. I also watched some videos by Geof Lawton, the permaculture guru. I’m hoping my next WWOOFing adventure will be at an established permaculture property where I can really learn some tried and true methods.I got to take my first shower in nearly a week today and it felt amazing. Then I was off on my trip back to the airport where I met a number of very friendly and interesting people to talk to, all of which gave me their details inviting me to stay with them next time I spent some time in Tasmania. I really love it here. The land, water, atmosphere and community just makes you feel like you’re in the right place at all times. I will really miss it but I’m excited to see my husband and set up a new adventure. First WWOOFing While Pregnant Adventure a SUCCESS! !